The Admiration Theory: nothing today is built to last for millennia; in fact, many things are built to purposely fail after a set amount of time. I can really admire the skill of ancient craftsmen who created buildings and art that outlived not only themselves, but sometimes also their entire civilizations. The Extreme Theory: am I big or small? Fast or slow? Important or insignificant? I can’t answer these questions with absolute certainty, but I can place myself on a continuum. To do so requires knowledge of extremes. Learning about the oldest human creations can help me to understand where I stand in the universe. The Limitless Theory: people are stuck to the Earth, can only move one direction in time, and eventually die. Knowledge and imagination are the only ways for us to extend beyond these limits. By learning about the distant past, I can pretend as if I had experienced it; my lifespan artificially increases by thousands of years. The Nostalgia Theory: technologies like computers, medicine, and plumbing ensure that life is better today than it has ever been in the past. But at the same time, the simplicity of our ancestors’ lives calls to me. I have an inkling that the people of the past were more in tune with themselves and with nature than I am right now—and therefore more satisfied, in a way. I can’t return to this time for a visit, so the next best thing is to study whatever remnants are left. The Significance Theory: ancient people had to spend most of their time finding food and protecting their families. They had even less free time than we do today—but they still somehow made time to build impressive monuments. Even if we don’t always understand why they were built, these things still deserve our attention and reverence. They have the power to fill us with a sense of mystical wonder. The reason I bring this up is that I was recently able to visit Newgrange—one of the best very old things on the planet. Newgrange is an ancient Irish passage tomb. Carbon-14 dating places its construction around 3200 BCE, making it over five thousand years old—older than Stonehenge, the Pyramid of Djoser, Mohenjo-Daro, the Easter Island statues, and nearly anything else famous for being old and mysterious. I first learned about Newgrange in high school, either by finding it on the internet or by studying it in art class. (I’m not sure which came first.) I always thought it was amazing, but it never occurred to me that I might be able to visit it some day. 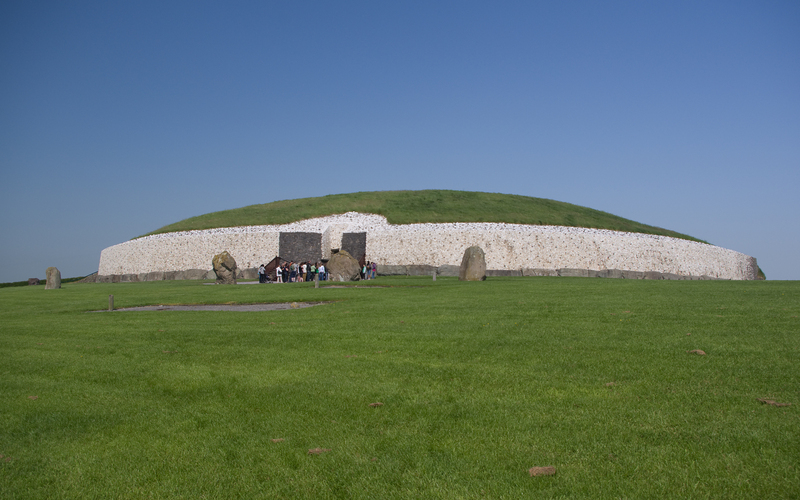 It turns out that Newgrange is less than an hour-long bus ride from Dublin. So when Heidi and I planned our trip to Ireland, I made sure that we would visit this ancient site. While Skellig Michael was probably the most dramatic and awe-inspiring thing I saw in Ireland, Newgrange was the most exciting to me, since I had known and wondered about it for so long. We happened to visit on a beautiful, cloudless day. Even though I had been drinking awake until 4:30 AM the night before and was running on about two hours of sleep, the combination of the perfect weather and the excitement of being at Newgrange made my mind crystal clear. Colors even seemed brighter than usual—I’m not kidding! 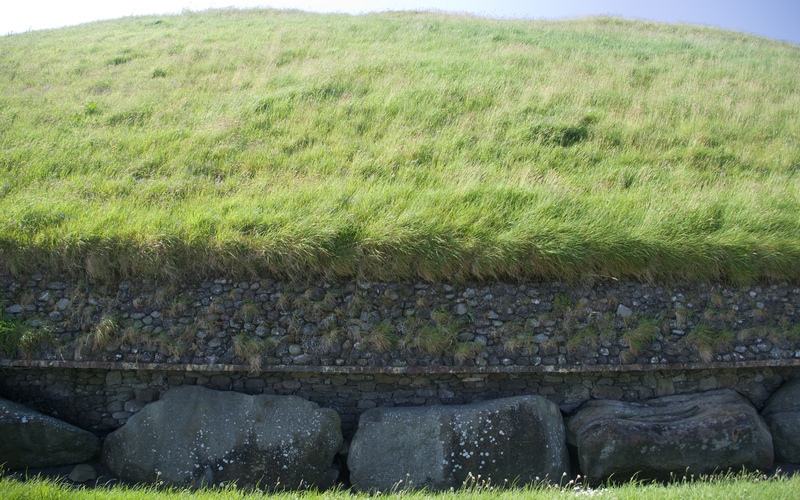 Newgrange is essentially a stone chamber buried under a huge mound of earth. A passageway leads to the outside, a stone wall surrounds it, and there are a few standing stones near its entrance. It was sealed and abandoned a few hundred years after its construction, and it remained hidden until 1699. People know a lot about its physical presence, but essentially nothing about its builders or its purpose. The current wall is a reconstruction—and a controversial one at that. It is held up by concrete because it won’t stay up on its own. Many people believe that if the wall requires concrete to stand, there is no way the ancient Irish could have built it. 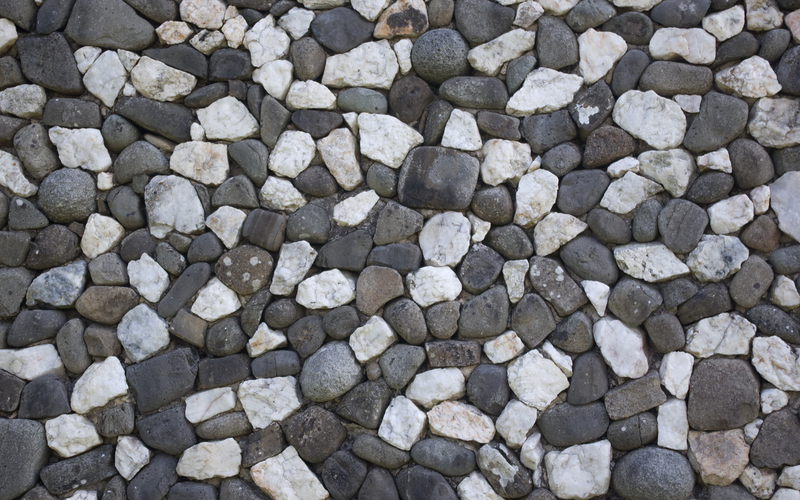 A popular alternative theory is that the stones of the wall were originally arranged on the ground as a kind of skirt. The entrance is perhaps the most famous part of Newgrange. One striking feature is the large carved stone, which features a three-spiral pattern. This is a rare symbol in ancient art, and Newgrange is one of its earliest expressions. The other important item is the small window above the door. The interior chamber is pitch black for most of the year, but the small window is built to let in the sun’s light during dawn and dusk on the winter solstice. Although the passageway and exterior wall have been restored, the inner chamber is completely original. Visitors can go inside, and can even touch the walls. What an electric experience! Cameras are not allowed inside, so you’ll just have to imagine what it’s like in there. I think it’s better this way. No camera could ever begin to capture the feeling of being inside a hill’s womb; no camera could capture the feeling of meeting a five-thousand-year-old ancestor through a stone medium. A camera would only weaken the magic by adding an extra veil between visitor and reality. Now, for my last picture: since I can’t show you the inside, I thought I’d show you the back of Newgrange. It’s certainly beautiful, but it never shows up in Newgrange photo galleries. The absence of the white wall makes it more authentic in a sense. I left Newgrange feeling fuzzy and happy. 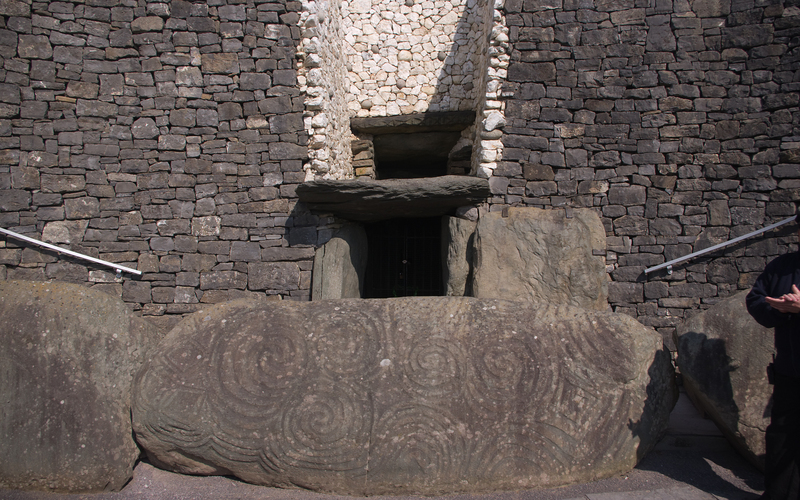 I hope this post has at least partially explained why, and I hope you’ve picked up a little bit of the awesomeness of Newgrange. Fourteen hundred years ago, an unnamed Irish monk decided to head out into the wilds. He was a rugged survivor, and his goal was to grow closer to God by living a simple life. Inspired by Saint Anthony of the Desert, he went to the literal end of the world—a tiny, inhospitable island seven miles off the coast of western Ireland. Clinging to the island’s steep rocky cliffs, the first monk eked out a humble existence by fishing and hunting for puffins. Bad weather often isolated him from the mainland for days or weeks at a time. He spent hours each day praying and meditating, and almost no time at all sleeping. Slowly but surely, he gathered rocks—sometimes he had to smash them loose with a crowbar—and began constructing a stone staircase from his usual landing point. Eventually, more monks joined him. They took their crowbars to the highest point on the island, broke the rock down, and built a flat terrace out of it. On top of the terrace, they built walls and stone beehive huts. Through sheer perseverance, they transformed the place into a home—not a fancy or comfortable one, but one that suited their desires. 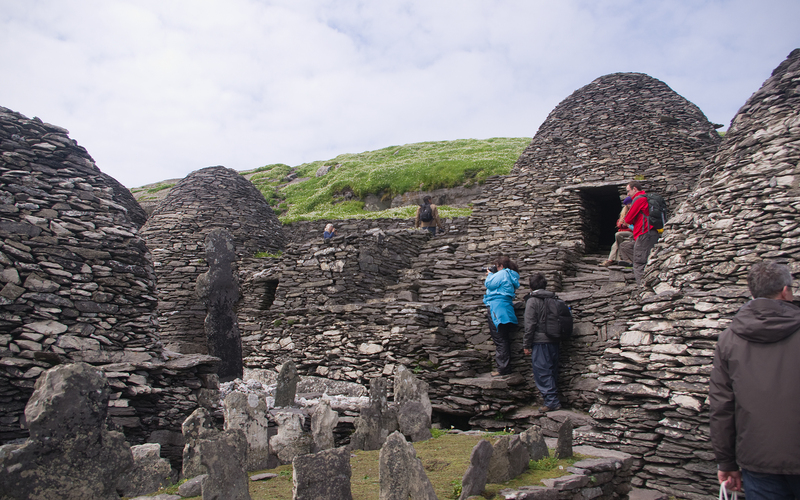 The island, now known as Skellig Michael, became the site of a small monastery that endured for over six hundred years. 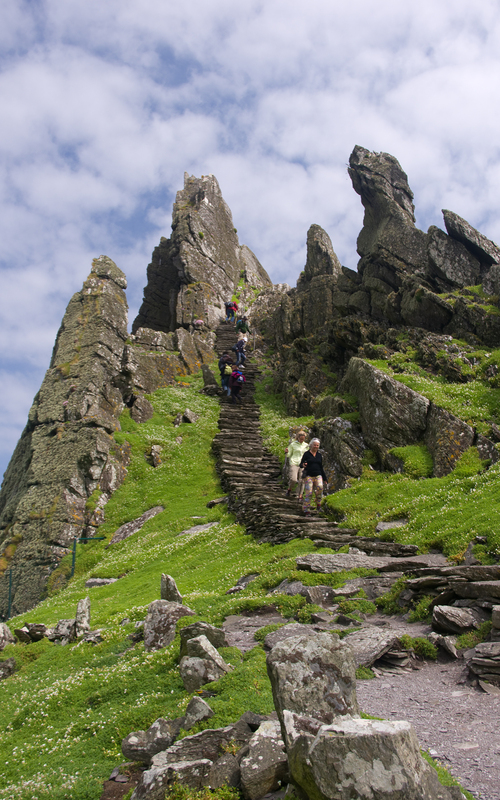 Even today, getting to Skellig Michael presents a challenge. Boats are only able to land during the summer, and usually only three days out of a week have suitable conditions. Even when it is possible to land, the island is often a dark and rainy place. I was fortunate enough to recently visit the Skellig Islands (Skellig Michael and the nearby Little Skellig) on a rare sunny day. Words and pictures can’t really describe the trip—but I’ll try to use them anyway. Heidi and I arrived in Portmagee the day before our trip. It was a fitting place to begin an expedition to the Skelligs—small and quiet, surrounded by natural beauty—it encouraged stillness and prepared our minds for the journey to come. Skellig experts checked the sea conditions in the morning, and everything seemed fine. 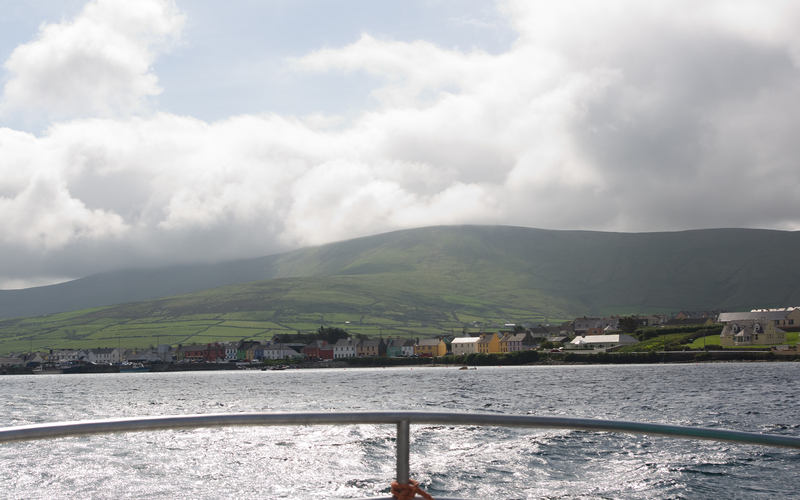 We got on a small motorboat—practically the only modern convenience of the whole trip—and started the choppy ninety minute trip to Skellig Michael. From far off, the islands looked featureless and gray. Skellig Michael appeared on the right and Little Skellig on the left. But as we got closer—passing Little Skellig and approaching the pier on Skellig Michael—they became alive with color. We landed, jumped off the boat, and started the climb to the top. The monks did this all without engines or a pier—what was it like for them? 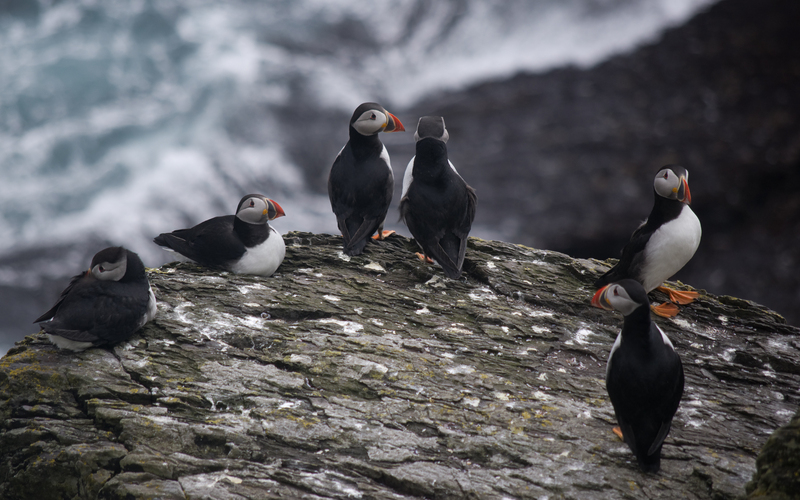 Partway up the path, we encountered our first puffins—a source of beauty for us, a source of food for the monks. We paused to rest at a place called Christ’s Saddle, where the staircase—the original, thousand-plus-year-old staircase—looms upwards at an ever-increasing angle. 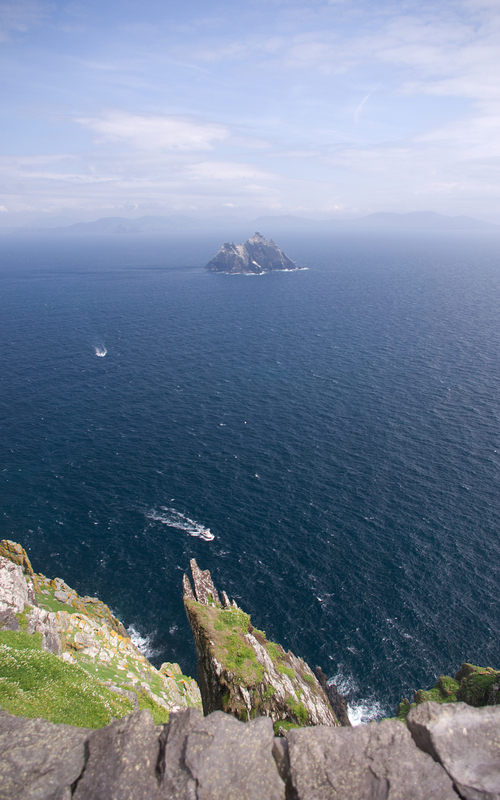 Part of the thrill of Skellig Michael is that even in this modern age, it remains a remote and untamed place. Two tourists died in 2009 after falling from this particular portion of the path. Closer to the top, we were treated to a glimpse of Little Skellig sitting like an uncut jewel in the great blue expanse of sea and sky. Out of breath, we finally reached the monastery at the top. The monks had built a chapel, a kitchen, a graveyard, a toilet, and several houses. There are even rumors of a secret underground tunnel somewhere in the complex. All of these structures were built entirely out of stone; not even mortar was used. Each stone piece was carefully placed to fit tightly with its neighbors and angled outwards to deflect rainwater. A closer view of the kitchen reveals that the monks even gave it vents to allow smoke to escape. I wish I could meet one of these monks: fisherman, hunter, engineer, laborer, ascetic, scholar, and meditator, all rolled into one person. Our pilgrimage complete, we walked back to the bottom and began our journey back home. 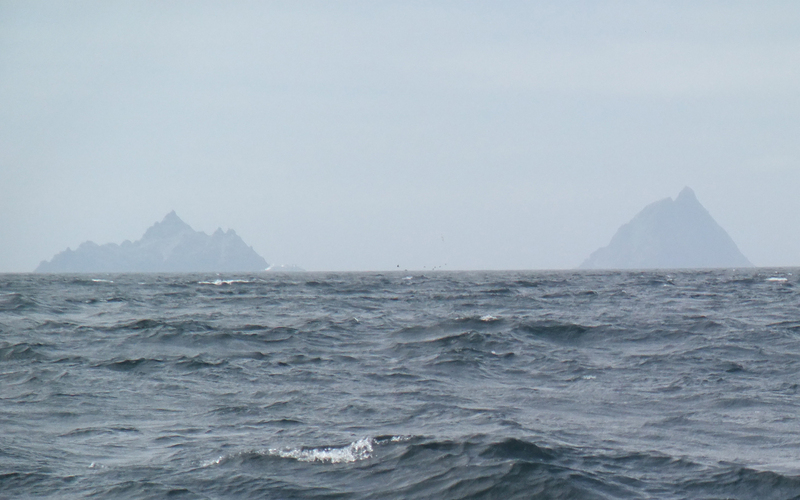 On the return trip, we made a close pass by Little Skellig. 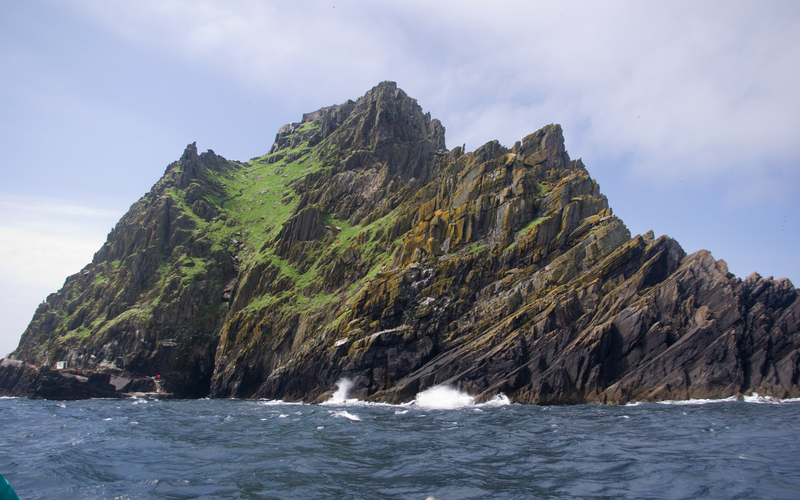 Little Skellig is even less hospitable than Skellig Michael, and it is nearly impossible to land on. People are actually forbidden to go there. 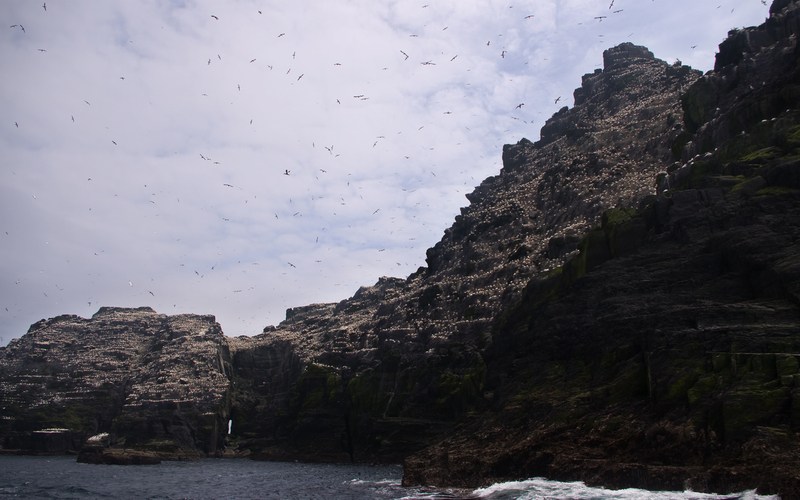 It is a haven for gannets; tens of thousands of gannets make their nests on Little Skellig each year. The whole island is white with them. I think I could have spent weeks on Skellig Michael in a state of constant amazement, and I was sad to leave after just two hours. At the same time, I’m extremely grateful that I was able to experience such a rare and interesting place—even if it was only for a short while. 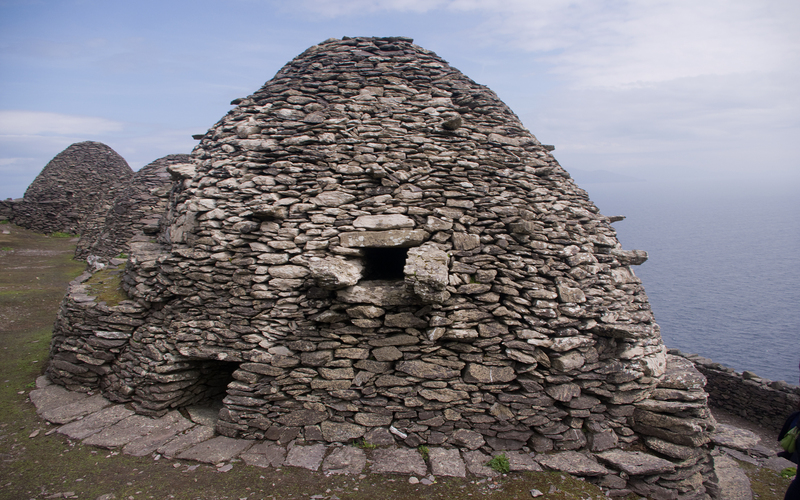 A free online book about the South peak of Skellig Michael. The main monastic settlement was on the North peak, but a few extremely dedicated monks led even more solitary lives on the steeper South peak. A book about all aspects of the Skelligs.